"The stench of the hold…was so intolerably loathsome that it was dangerous to remain there for any time…but now that the whole ship’s cargo were confined together, it became absolutely pestilential. 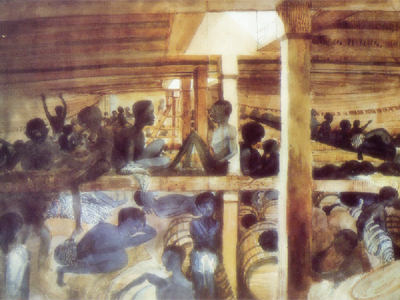 The closeness of the place and the heat of the climate, added to the number in the ship which was so crowded that each had scarcely room to turn himself, almost suffocated us"
The Middle Passage did not begin with the transatlantic voyage, but with the capture and sale of Africans, and ended with their forced ‘adjustment’ to life in the Americas. It is one of history’s most horrific chapters, showing the human capacity for both cruelty and insensitivity and strength and survival. It is difficult to calculate the numbers of Africans that were transported; estimates have ranged from five million to 30 million. Further millions died during capture and on the journey across the Atlantic. History has seen few social disruptions on such a scale. The voyage itself took between 6 and 8 weeks. The enslaved Africans were chained together by the hand and the foot, and packed into the smallest places where there was barely enough room to lie on one’s side. It was here that they ate, slept, urinated, defecated, gave birth, went insane and died. They had no idea where they were going, or what was going to happen to them. Through all this misery and suffering, new African identities were created, forming a basis for a new transnational culture. 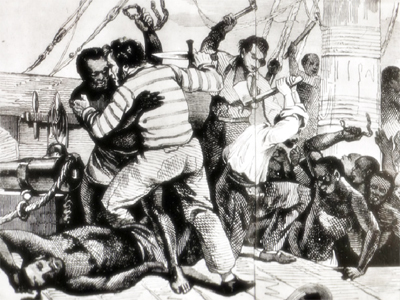 Within these ships, Africans from different countries, regions, cultures and with different languages learned to communicate with each other; many conspired to overthrow their captors together. "A woman was dejected from the moment she came on board, and refused both food and medicine; being asked by the interpreter what she wanted, she replied ‘nothing but to die’, and she did die". Others chose to express their resistance more violently – "a man sold with his family for witchcraft", testified Dr Trotter at the parliamentary select committee, "refused all sustenance after he came on board. Early the next morning it was found that he had attempted to cut his own throat. [Dr Trotter] sewed up the wound, but the following night the man had not only torn out the sutures, but had made a similar attempt on the other side. He declared that he would never go with white men…he died of hunger in eight or ten days". "...Upon the Negroes refusal to take sustenance..."
"...The deck…was so covered with the blood and mucus..."
"...few of the negroes can so far brook the loss of their liberty..."
"...a black woman seized some dirt from an African yam ..."
"...The misery which the slaves endure in consequence of too close a stowage is not easily to be described..."
"...the slaves complain much of the heat, and sweat so when confined below..."
"...a slave vessel belonging to Brest, having been becalmed in the Middle Passage fell short of provisions and water..."
"...the enslaved Africans show signs of extreme distress and despair..."
The following passages describe the conditions of enslaved Africans onboard slave ships during the Middle Passage, a journey from the west coast of Africa across the Atlantic Ocean. Match the quote with the correct author. "The captain of an English ship had enticed several of the natives on board, and finding a favourable opportunity, sailed away with them. His vessel however was driven back to the coast from whence it had set sail, and was obliged to cast anchor on the very spot where this act of treachery had been committed. At this time two other English vessels were lying in the same river. The natives, ever since the transaction, were determined to retaliate…they accordingly boarded the three vessels, and having made themselves masters of them, they killed most of their crews."